• Check with the Registrar’s Office to verify your information. • Purchase your cap, gown and tassel for undergraduate candidates. • Rent a UND-custom gown, hood, tam/cap and tassel for graduate candidates. • Talk to Student Financial Aid about student loans and payments. • Order a class ring and diploma frame - 20% off diploma frames. • Purchase generic or customized graduation announcements - 50% off select graduation announcements. • Visit with School of Graduate Studies reps about post-graduate options at UND, including online. • Discover how Career Services can help you in your job search. • Check out party platters and catering options available through University Catering. • Request any ceremony-related disability accommodations for graduates and guests. 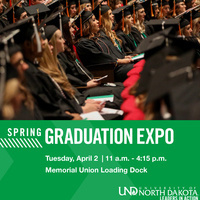 • Visit with the UND Alumni Association & Foundation about services available to new graduate and ways to keep in touch with UND! • Win door prizes and enjoy refreshments!